Credit: Pixabay/PublicDomainPictures. CC0 Public Domain. In Buddhism, the lotus flower is often used as a metaphor for awakening, with its roots in the mud and its blossom exquisite. 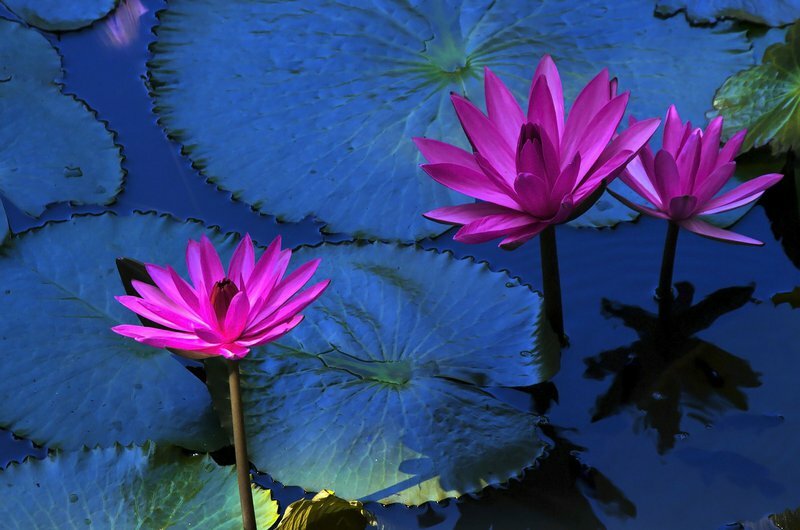 A fully bloomed lotus represents enlightenment, the bud everything that comes before. At first, the bud is tight, solid, a single dense thing. One petal at a time, it softens and opens. It’s an apt metaphor for healing, too, or at least my own experience of it, when breakdown sent me reeling into an extended ‘dark night of the soul.’ There was no single panacea—no solve-all secret, no grand rescue, although I certainly wished for one—but rather many petals, each unfurling a different layer of my tightly-clenched being: the nervous system, the physical body, the psyche and the spirit. At every step, mindfulness provided a crucial foundation. My nervous system had long been operating in fight-and-flight mode, and so my adrenal glands were depleted and I was utterly exhausted. Working with a generous and gifted practitioner of Somatic Experiencing, a body-based approach to healing trauma, I began to learn to function in a more balanced manner—or rather, my nervous system did. As psychiatrist and PTSD researcher Bessel Van der Kolk writes, “traumatized people feel chronically unsafe inside their bodies: the past is alive in the form of gnawing interior discomfort.” Talk therapy was insufficient; my nervous system had to learn that it was safe, and this came through touch and feedback. Meditation had been a wonderful training ground for the kind of mindfulness I needed to bring to this practice, a focused tracking of bodily sensations. But it was vital to have a guide to gently redirect me. For wounds that are inherently relational, I believe the healing must be, too. Over time, I began to learn to trust the body that I believed had betrayed me. Much of what I’d stored away many years earlier was buried in shame; to enter these dark spaces with a guide leavened this shame, steadily eroding the associated emotional isolation. As my resilience grew, life became more bearable. Cars passing by on the street no longer felt like they were driving through me; singing no longer cracked me in two; I could be among people, even socialize a little. I began to emerge from a form of hermitage. Then there was movement, Authentic Movement specifically: in a circle of eight women, guided by a wise facilitator, I found the space for my body to begin to express what had long been repressed. This came through voice (as a singer this was key) and also the exploratory movement of my limbs. And then, once I was strong enough to return to it, there was free-form ecstatic dance, and the reliable joy it lent. And Biodanza, a guided movement practice centered in presence and deep connection. Then a friend told me about the work of Byron Katie, who teaches an inquiry process to identify and question the thoughts that cause suffering. I dived in wholeheartedly, methodically unpinning many of the beliefs that had kept me mired in fear and self-hatred. I began to see my internal world shift in significant ways. As these old ways crumbled, I started to touch an abiding sense of freedom, and more joy followed. This list of practices and techniques isn’t comprehensive. There were also friends who were beacons for me at a time when everything went dark. Their care and wisdom kept me tethered to the earth, and to sanity. There was acupuncture, which brought palpable relief to a system stuck in fight-or-flight. And there were teachers from Buddhist and Advaita traditions who had themselves passed through something this extreme, and assured me that I would make it, that I wouldn’t lose my mind. I’ll never forget how one of them, Jeannie Zandi, took me onto her lap and held me until my body began to calm. Then there were the trees. At times I thought of them as my lovers, holding me steadily through these aching years. At night I’d walk to one of my favorites, climb up and lie in its broad branches. There I would rest and pray until I felt strong enough to pick myself up and face the next hour. On sunny days I lay on the ground. In my worst times of exhaustion and despair I was held by the earth itself. There were drugs, too. I was adamantly opposed to pharmaceuticals, and it took months of hell followed by the personal persuasion of one of our most respected meditation teachers to change my mind. Did they help? Yes, I believe so. But they hurt as well. A psychiatrist who told me to stop taking a powerful sleep medication once my sleep had stabilized plunged me back into hell for months. I learned to move in millimeters, and warily. The drugs didn’t heal me, but they eased my suffering. Gradually I came to see them as a kindness I could give to myself instead of a source of shame. If there was any abiding thread, any golden string out of the opaque maze, it was learning to hold myself with compassion. At its worst, when my nerves were shrieking and my body on fire, I’d put my hands over my heart and call myself sweetheart, angel, darling. I’d tell the rage it had a good point, tell the fear I wasn’t running away this time, the hatred that it was welcome. “Even as a mother protects with her life her child, her only child,” said the Buddha, “so with a boundless heart should one cherish all living beings.” I learned to include myself in my compassion. I learned to hold myself like a screaming infant, and give to myself as to a starved child. This wasn’t due to any great ability of my own. I simply had no choice. If I didn’t learn to be patient with myself when I could hardly function, I’d never have healed. That’s what I say when friends offer me praise. I don’t deserve it; courage had nothing to do with this. Were you in my position—and I hope you never are—you’d have done the same. It was that or my life. There were moments when I fervently wished I was dead, that some disease would come and take me, some accident wipe me out. But I didn’t die, at least not in the traditional sense, and now that I’m on the other side I marvel at the gifts I’ve been given. Half my life is spiritual practice, I said to a teacher recently. Yet the amazing thing is that, on emerging from this spectacularly dysfunctional period, I have the space for ample practice, and to write and sing and teach. When I had no choice but to surrender utterly—to accept that I might be unable to pay rent next month, even that I might not heal—I started to see that I could trust life. I started to relax into it. And life took me by the hands and began to dance. Recently I’ve begun to teach on the theme of the ‘dark night of the soul’ as a component of awakening. I’ve come to believe that if we muster what it takes to face the work that life presents to us, then life in turn will hold us as we do it. Sometimes that work is in our own minds, other times in our communities; if we are listening, we may discover an organic rhythm between these two dimensions. Both are needed. Most often we do not have to seek it out, this work. Instead, it reveals itself to us—sometimes subtly, like a dove alighting on an outstretched arm; sometimes a tornado that sweeps us up and drops us somewhere else entirely. I’m sharing my story now because I hope to help others locate the narratives to usher them through their own experience of the underworld—and to do so without the terrible burden of shame our culture heaps on anything resembling mental illness, which I at times found as crippling as the experience itself. I want others to discover the gifts hidden in these dark nights, gifts they will in turn deliver to a world that sorely needs them. I want, in short, for others to suffer less than I did. I still have to rest a lot, and I topple into adrenaline-charged emergency mode at the drop of a hat. But I am more resilient, and better at letting go, and it seems that my suffering has diminished in inverse proportion to the growth of these capacities. Most days I am happy. I no longer need crisis to invoke change; the dance has slowed to a foxtrot. At some point, many of us will be broken by life, whether in ways obvious or hidden. If we stay soft, stay open, the heart will expand, the mind grow clear. Breaking and healing: I’ve come to believe they are different movements of the same underlying love. Sometimes that love must be ferocious to wake us up. We are seeing this play out in the world today: more darkness center stage, more light rising in response. Not only is there the individual experience of breakdown, but systems and institutions that we believed unshakeable are also beginning to crack. Ecosystems are changing before our eyes, and the scale of environmental loss is prodigious. It can be terrifying to watch the dissolution of the things that we believe have kept us safe; excruciating to see the destruction of things that we love. Faced by these circumstances, it may take every ounce of will we possess not to collapse into fear or explode into rage. But even as the skies darken, there are considerable gifts. We are being offered a superb opportunity to develop the strength and wisdom we will need to rise to the occasion. There is, I would venture, a greater story unfolding here, with a much wider arc—one that bends inexorably toward the light.